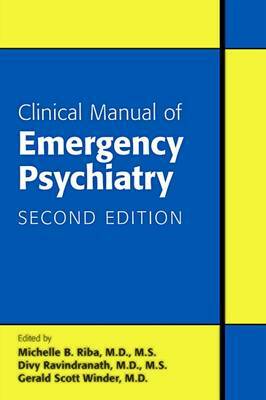 The second edition of Clinical Manual of Emergency Psychiatry is designed to help medical students, residents, and clinical faculty chart an appropriate course of treatment in a setting where an incorrect assessment can have life-or-death implications. Arranged by chief complaint rather than by psychiatric diagnosis, each chapter combines the fresh insights of an accomplished psychiatry trainee with the more seasoned viewpoint of a senior practitioner in the field, providing a richly integrated perspective on the challenges and rewards of caring for patients in the psychiatric emergency department. This newly revised edition presents current approaches to evaluation, treatment, and management of patients in crisis, including up-to-date guidelines on use of pharmacotherapy in the emergency setting; suicide risk assessment; evaluation of patients with abnormal mood, psychosis, acute anxiety, agitation, cognitive impairment, and/or substance-related emergencies; and care of children and adolescents. The editors have created an accessible text with many useful features: A chapter devoted to effective strategies for teaching, mentoring, and supervision of trainees in the psychiatry emergency service. Chapters focused on assessment of risk for violence in patients, determination of the need for seclusion or restraint, and navigation of the legal and ethical issues that arise in the emergency setting. Clinical vignettes that contextualize the information provided, allowing readers to envision applicable clinical scenarios and thereby internalize important concepts more quickly Constructive "take-home" points at the end of each chapter that summarize key information and caution against common clinical errors. References and suggested readings to help readers pursue a deeper understanding of concepts and repair any gaps in knowledge. Emergency psychiatry is one of the most stressful and challenging areas of practice for the psychiatric clinician. The guidelines and strategies outlined in Clinical Manual of Emergency Psychiatry, Second Edition, will help psychiatric trainees and educators alike to make sense of the complex clinical situations they encounter and guide them to advance their skills as clinicians and educators.